In concert halls, classrooms, church basements and coffeehouses across the country, John Rossbach shares with others his love for traditional American music. The airplay generated by his first album, This Is Where I Came In, garnered high praise from the best journals in the trade and from traditional music lovers around the globe. His appearance with Bristol Mountain Bluegrass on the Nashville Network's Fire on the Mountain show was televised nationwide. 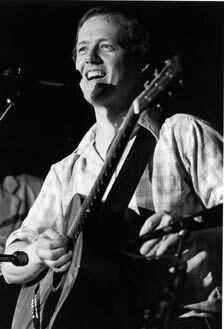 His bluegrass ensemble, John Rossbach & Chestnut Grove, was selected for the 1989 International Bluegrass Association Showcases. John recently recorded an album of old-time Appalachian stringband music with Mac Benford and the Woodshed All*Stars, featuring fiddler Pete Sutherland. Since then, he's toured the highways and backroads of American from the the hills of West Virginia to the rivers of Quebec, and from the heartlands of Michigan to the headlands of Maine. For the past five years John has participated in the Central New York Institute for Aesthetic Education and the Central New York Community Arts Council both as a repertory member and as a teaching artist. These performances are part of an interdisciplinary education program piloted by the Lincoln Center for the Performing Arts. He regularly presents original workshops on bluegrass and traditional American music for both children and adults. John has been presented under grants from The New York State Council on the Arts, Imagination Celebration, and the New York State Department of Education. He is also the recipient of several Meet the Composer grant awards, and was a nominee in two categories for the '93 SAMMY Awards. John has been featured in several major publications, including a cover story in The Bluegrass Gazette, and was the central figure in the television documentary, Bluegrass Attitude. He has appeared on numerous radio and television programs, including the nationally syndicated Bluegrass Ramble. John has also performed at most of the established folk, bluegrass and old-time music festivals, including the Champlain Valley Folk Festival, the Winterhawk Bluegrass Festival, the Wheatlands Bluegrass and Old-Time Festival, Brandywine, the West Virginia Appalachian Stringband Festival and the Gettysburg Bluegrass Festival. John's favorite instrument is the human voice, but he is also a master of the guitar, mandolin and banjo. In his solo sets, John's clear and powerful voice, compelling instrumental style and creative arrangements blend the mournfulness of mountain ballads with the grit of country blues. He mixes the drive of reels and breakdowns with the bounce of boogie-woogie. He'll belt out more old-time country standards than anyone you've ever ment, and if you ask him to, he'll even throw in a pop tune or two. John is a serious musician who has fun on stage.